The Town of Lebanon was born in 1818 as a result of a court appointed commission’s search for a new county seat for Russell County. Two years earlier a movement was begun in the County to seek a new location for the seat of government which at the time was located near Dickensonville. 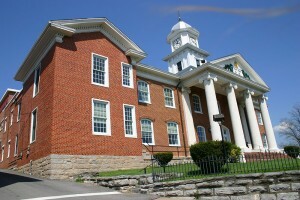 People in the county were displeased with the location of the county seat. They wanted it to be more centrally located and have a better supply of water. Petitions were signed and presented to the Virginia Assembly to have the county seat moved. David Alexander and Andrew Cowan conveyed the land to the county for the new seat of government on the condition that a “Temple of Justice” be built (Deed Book No. 5, Page 430). One of the main reasons for which they settled the site was the first never failing springs. The Court appointed seven commissioners (Deed Book No. 5, Page 433), namely Zachariah Fugate, Benjain Johnson, Daniel Horton, David B. Alexander, H. Smith, Francis Browning and James McFarlane, who laid out the Town called Lebanon. The twenty (20) acres were surveyed on June 29, 1816, and thirty-eight (38) lots were laid off. The commission selected Lots 37 and 38 for the future “Seat of Justice.” Lot 27 was set aside for the public; it had a huge spring located on it. Almost two years later, February 3, 1818 the commission reported to the court that the “Temple of Justice” was completed. The court ruled that the next session would be held there. On March 3, 1818, John Tate, Zachariah Fugate, John Chandler, James Browning, Samuel Gibson, the “Gentlemen Justices”, held court. The ground work had been laid-the thirty-four lots were sold by March 4, 1819. Elk Garden Church – The second-oldest church in Russell County, located near the original fort on Clinch River Frontier. Jessee's Mill – Jessee's Mill began operation over 200 years ago, predating the census and tax records of 1790. The mill was the primary source for ground agricultural products and other trading in the Mill Creek Area. The site is located on Jessee's Mill Road, State Route 645, north of Route 71, between Lebanon and Cleveland.